A lot of people have been talking about Back to the Future and October 21, 2015, because that was the day that Doc Brown and Marty McFly traveled to in the future. I've been reading a good deal about the movie, the predictions with the Cubs, and such, but I forgot all about what today was until late this afternoon. I was with my wife Jenny, doing errands, and she suggested with go to a nice antique shop on Route 1, just for the heck of it. Okay, I said, and before I know it, I find myself looking casually at various items. Included in this place was a nice bunch of old Hot Wheel cars and such. One of the cars jumped out at me. 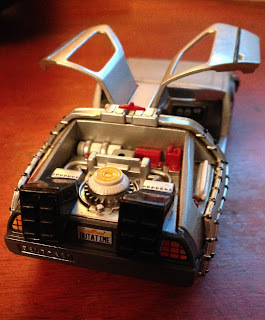 It was obviously an excellent scale model of the BTTF DeLorean time machine, down to opening and closing doors and all. It was $5, and I purchased it. I had just watched, on demand, Back in Time (2014) this week, and respected what careful restoration collectors had done with full-sized DeLorean time machines. Cool, I thought. I found a small one. As it turns out, this model was a Corgi (2001-2005), quite an attractive collectible. But, wait, what is today? It is November 5, 2015. How could I have overlooked the date? It is an amazing time sync that I would discover this model car on this date, by pure chance. According to the Futurepedia, this is a special date in BTTF history, of course. Saturday, November 5, 1955, is the date when "history is changed." On November 5, 1955, Marty McFly used the DeLorean time machine to escape Libyan terrorists and accidentally traveled back in time to the very day Dr. Emmett L. Brown conceived of the possibility of time travel: Nov. 5, 1955. Where the Twin Pines Mall would someday stand, Marty arrived at the Twin Pines Ranch and crashed into Otis Peabody's barn. November 5, 1955, was the day Marty was hit by the car instead of George, changing history. November 5, 1955, also was the day when, while hanging a clock in his home bathroom, Dr. Emmett Brown slipped and hit his head on the porcelain sink and had an epiphany: a vision of the flux capacitor, which he theorized could make time travel possible. He was only able to realize his dream after 30 years of toil and, in 1985, he built a time machine out of a DeLorean. So, today, marks 60 years, for BTTF, since these famous fictional points in history. As it turns out, I saw another movie earlier in the week that recalled for me the strange overlaps between that film, BTTF, and November 5th. Jack the Ripper: It's catching isn't it, violence. Time After Time (1979) is an intriguing examination of time traveler and much more. As Wikipedia nicely summarizes, in 1893 London, popular writer Herbert George Wells (Malcolm McDowell) displays a time machine to his skeptical dinner guests. After he explains how it works (including a "non-return key" that keeps the machine at the traveler's destination and a "vaporizing equalizer" that keeps the traveler and machine on equal terms), police constables arrive at the house searching for Jack the Ripper. A bag with blood-stained gloves belonging to one of Herbert's friends, a surgeon named John Leslie Stevenson (David Warner), leads them to conclude that Stevenson might be the infamous killer. Wells races to his laboratory, but the time machine is gone. Stevenson has escaped to the future, but because he does not have the "non-return" key, the machine automatically returns to 1893. Herbert uses it to pursue Stevenson to November 5, 1979, where the machine has ended up on display at a museum in San Francisco. Reasoning that Stevenson would need to exchange his British money, Herbert asks about him at various banks. At the Chartered Bank of London, he meets liberated employee Amy Robbins (Mary Steenburgen), who says she had directed Stevenson to the Hyatt Regency hotel. Time machines, November 5th, Mary Steenburgen. Why does this show so familiar? Because in the BTTF franchise, we revisit all of this in the near future past of 1985, 1955, and 2015. As one online forum exchange noted, the number 115 (specifically as 11/5, November 5th) is the day that Marty goes to in BTTF, as a time 1:15 is when Marty is to meet Doc (Marty gets there as the clock changes to 1:16...upside down 911). The fact that November 5, 1979, turns up as the date of significance in the time travel of Time After Time is weirdly compelling. Mary Steenburgen's character, Amy Robbins is the love interest of Malcolm McDowell's character, H. G. Wells. And because they met on the set of Time After Time, they would actually fall in love in their future, marry in 1990, have children, and divorce ten years later, in 1990. Where was Mary Steenburgen in 1990? Starring in Back to the Future Part III. Mary Steenburgen/Clara Clayton would, in 1990, play Christopher Lloyd/Doc Brown's love interest in Back to the Future Part III. Steenburgen's father Maurice Steenburgen was train conductor who worked at the Missouri Pacific Railroad. In BTTF 3 Clara and Doc travel in a time machine made from a train, with 4-6-0 ten wheeler steam locomotive. There's something to this Mary Steenburgen angle that remains unexplored, I feel. Mary Steenburgen would meet her next husband, Ted Danson, in 1993, when filming the 1994 Pontiac Moon, about the 1969 landing of Apollo 11 on the Moon. They were married in 1995. Yeah, the faux guy "we" still burn effigies of. Protestant/Catholic - divide and conquer. Over here, 21st Oct 2015 is 21 10 2 015. Discount the zeros 2112 is. 21/12 (12/21 US) numbers dates. End of the world a couple of years back, soung by Rush, etc. etc.